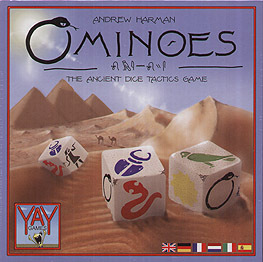 Players race to grab points in this fast paced game of ancient cunning. Simply Roll an Ominoe, Move an Ominoe and Add an Ominoe to form groups of four or more to score points. But beware - fortunes can change faster than the shifting desert sands as you move your opponents' Ominoes in a tight dice tactics battle. ... and call on the ancient Gods.